Primary care providers are often the first contact for families and children with regard to dental care. Teething and the subsequent care of those teeth are commonly addressed during preventive care visits. Because oral health is an important part of overall health, practitioners must be comfortable providing anticipatory guidance and recommendations for the appropriate care of dentition. As children get older, it is important to continue to assess dentition and provide age-appropriate guidance. 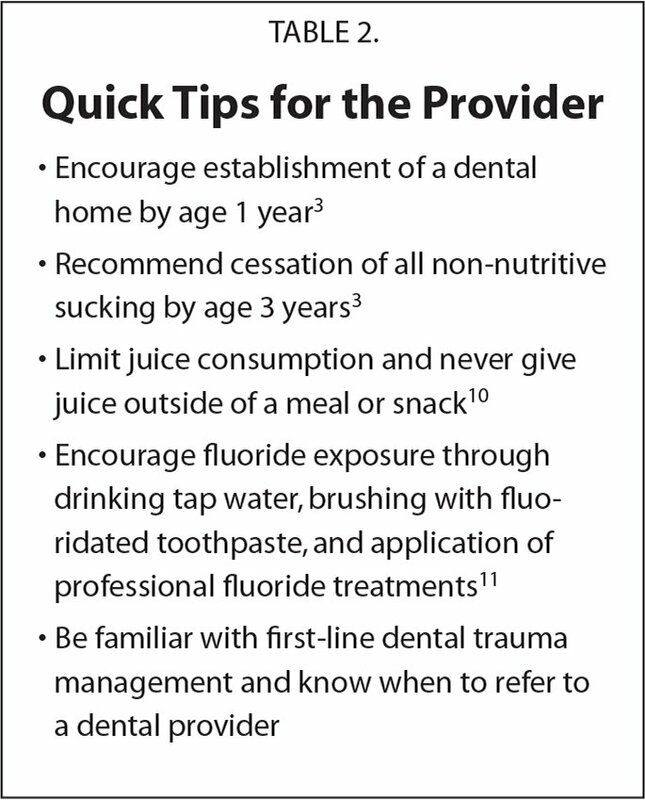 From caries avoidance to trauma prevention, primary care providers can give information to our patients that will optimize their oral health. The primary care office or the emergency department are often the first stop for children with dental injuries, as pediatric dental care can be limited in certain areas. 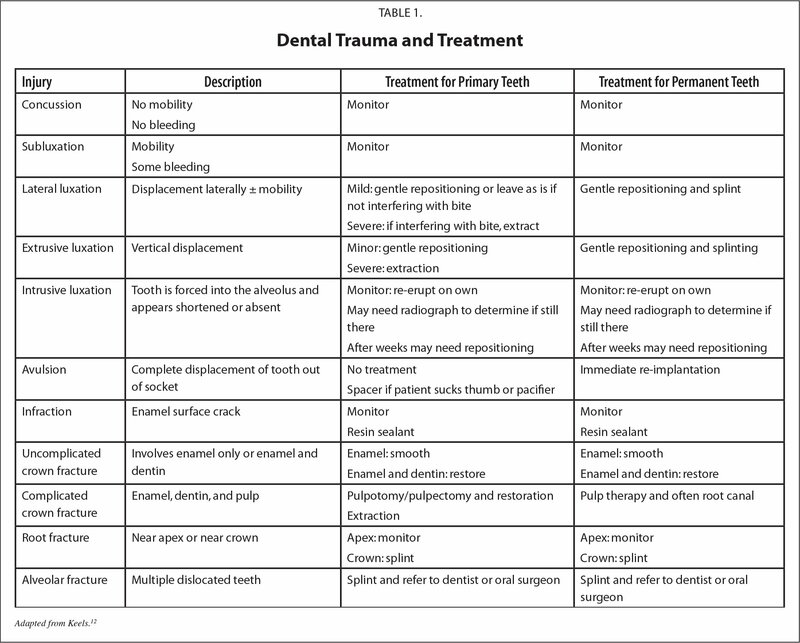 Because early intervention is important in many cases, health care providers need to be able to assess and manage the initial stages of dental trauma as well. This article aims to provide clinicians with basic knowledge of dental anatomy and development, guidelines and recommendations regarding common issues related to oral health, and an understanding of acute management of dental trauma. For providers to be able to document and discuss dentition adequately, they must be familiar with the correct dental terminology. There are two sets of teeth to be considered—the primary teeth (which eventually exfoliate) and the permanent teeth. Each tooth consists of two parts—the root, which is not visible and is located beneath the gumline; and the crown, which is the portion of the tooth that is above the gumline and visible in the mouth. Each tooth also has several layers. There is pulp in the center, dentin covering the pulp, and enamel on the outside, which is what is exposed to the environment. A medical provider is often the first contact for dental care in infants and young children. One survey demonstrated that 89% of infants and 1-year-olds had seen a health care provider in the past year, whereas only 1.5% had seen a dentist.2 It is important to include a dental assessment in every well-child visit to provide anticipatory guidance regarding recommendations for oral health and appropriate referral to a dental provider. Juice consumption and exposure of the dentition to sugar is an important determinant of caries risk in young children. Although juice and juice drink sales have declined in recent years, data from 2008 to 2013 showed that children age 2 to 18 yeas received one-half of their fruit intake from juice.10 This has improved in recent years, but consumption of juice, juice drinks, sports drinks, and energy drinks continues to be a problem and contributes to early onset of dental caries. There are many different types of dental trauma and treatment depends on whether the tooth is a primary or permanent tooth. For all injured teeth that do not require immediate treatment, there should be close monitoring for discoloration or infection.12 Injuries can be grouped into three categories: concussions, displacements, and fractures (Table 1). Concussed teeth are tender to touch but there is no increased mobility or displacement of the tooth.12 There is generally no bleeding at the margin of the tooth and gums.12 Concussed teeth, both primary and permanent, require no treatment. Health care providers play an important role in promoting good oral health (Table 2). Not only are they often the first point of contact for dental management in infants and young children, they are often the first to evaluate dental trauma as well. They must be able to provide good guidelines for caries prevention, age-appropriate anticipatory guidance regarding dentition, and appropriate referral to a dental home. The more comfortable providers are with dental questions and concerns, the better care they can provide to their patients. Logan WHG, Kronfeld R. Development of the human jaws and surrounding structures from birth to the age of fifteen years. J Am Dent Assoc. 2003;20:379–427. American Academy of Pediatric DentistryCouncil on Clinical Affairs. Periodicity of examination, preventive dental services, anticipatory guidance/counseling, and oral treatment for infants, children, and adolescents. http://www.aapd.org/media/Policies_Guidelines/BP_Periodicity.pdf. Accessed December 13, 2018. American Academy of Pediatric DentistryCouncil on Clinical Affairs. Policy on oral health care programs for infants, children, and adolescents. http://www.aapd.org/media/policies_guidelines/p_oralhealthcareprog.pdf. Accessed December 13, 2018. American Academy of Pediatric DentistryCouncil on Clinical Affairs. Caries-risk assessment and management for infants, children, and adolescents. http://www.aapd.org/media/Policies_Guidelines/BP_CariesRiskAssessment.pdf. Accessed December 13, 2018. American Academy of Pediatrics. Oral health risk assessment tool. https://www.aap.org/en-us/Documents/oralhealth_RiskAssessmentTool.pdf. Accessed December 13, 2018. American Academy of Pediatric DentistryCouncil on Clinical Affairs. Policy on use of fluoride. http://www.aapd.org/media/policies_guidelines/p_fluorideuse.pdf. Accessed December 13, 2018. American Academy of Pediatric DentistryCouncil on Clinical Affairs. Policy on prevention of sports-related orofacial injuries. http://www.aapd.org/media/Policies_Guidelines/P_Sports.pdf. Accessed December 13, 2018. Leah Khan, MD, is a Pediatrician, Park Nicollet Clinics. Address correspondence to Leah Khan, MD, 300 Lake Drive East, Chanhassen, MN 55317; email: leahdkhan@gmail.com.